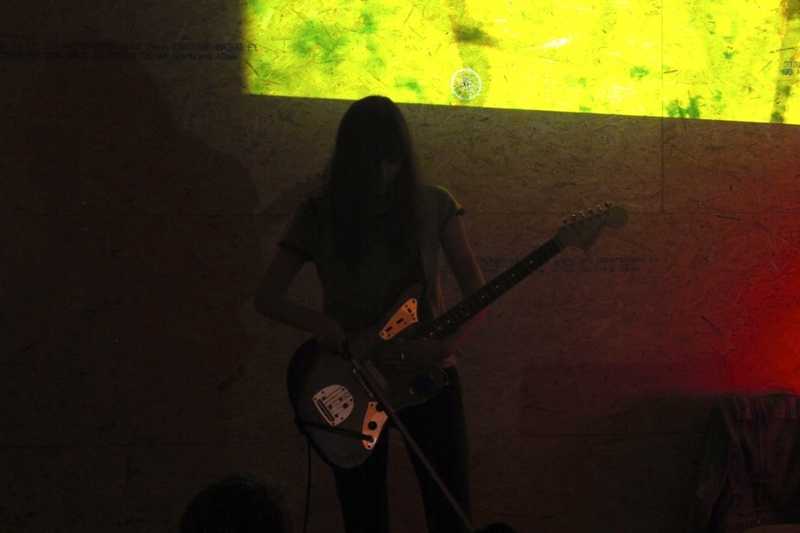 Sarah Lipstate is a sound artist from Brooklyn who is known for her expansive drone soundscapes produced under the name Noveller. Michael Aniser: You’ve just finished touring, is it your first time in Europe? Sarah Lipstate: No, I’ve played in Europe several times, I’ve done some festival shows or just flown over. I toured with Aidan Baker in 2010. MA: What’s your connection to Aidan and the band Nadja? SL: When I was in college I had an experimental music radio show. Aidan used to send me the Nadja records to play on my show, so I knew him initially through emails and receiving his records to play them on the radio. In 2009, I was in touch with this Canadian label called Divorce Records who were talking about doing a split LP. The label guy had the idea that Aidan would do the split with me, however, we didn’t actually meet until Aidan and I toured in the US. Bianca Heuser: How did you get into making music? SL: When I was 17 I saved up enough money from my summer job to buy my first electric guitar. I grew up playing piano and then I played the Trombone in High School but what I really wanted to play was the electric guitar! However, because my parents weren’t really into it I had to buy my first electric myself—I just wanted to kind of do my own thing. Initially I started out playing more rock stuff, then, when I was 19 I went to college in Austin and started meeting other musicians. I was dating this guy who played synthesizer and we started doing these improvised recordings, just me and my guitar, a delay pedal, and him playing synth. That’s how I got into making abstract music. MA: How long have you been doing this project, then? SL: The earliest recordings from Noveller are probably from 2005 when I was still living in Austin. I moved to Brooklyn right after I graduated in January 2007. It wasn’t until I moved to New York that I started playing live shows. Making the leap from bedroom recordings to playing live was when a lot of the development happened, and since then I started to play the guitar a lot more. The very first show I played I had this double neck guitar! I didn’t really play it though, I just used it as kind of sound source. Since then I’ve incorporated more melody and more structure, but without making it too focused on the technical ability. I don”t want to create anything too song-like but concentrate on actually using the guitar in multiple ways. MA: Do you have a special relationship to your guitar? SL: When I was 18 or 19 I got really obsessed with constantly trading in gear and getting new stuff. I was going to pawn shops every other week. I grew out of that and realized that it’s much more important to spend time with what you have and get to know it inside and out and actually develop a relationship with your instrument. In August I played a show in Manhattan and afterwards someone broke into my car and all my pedals and one of my amps got stolen. I had to totally rebuild my collection—I had a lot of people donate pedals to me and offer to send me money or gift cards to music stores. These pedals I’m using now are brand new to me, and they sound completely different to what I had. It’s devastating and it’s completely changed my sound. It’s hard to play my older songs with this new gear but I feel like it’s a creative inspiration to write new material, in a way. MA: Working with what you got, that brings us straight to Elle, who is a contemporary dancer. You know each other from where? Elle Erdman: Our mutual friend Nancy Garcia, who is a Noise-musician and dancer—she was dancing at the Merce Cunningham studios—had a premiere at the “Kitchen” in 2009 and she wanted to do a dance, yet she was directly involved in doing music on the stage and invited four dancers and musicians. One of them was Sarah. MA: Contemporary dance is so divorced from words, from the world of lyrics and verbal communication, but how does it fit with your abstract sound? SL: I feel like sound is so incredible, I had some people do really amazing things with my music: I had this photographer play my music through a speaker that had a bowl of water on top of it. He was then able to photograph these amazing patterns, like mathematical patterns, that would emerge from the vibrations of my music. It’s amazing what kind of visualizations can come about either directly influenced from the sound or just interpreted by a dancer or a filmmaker—there are so many different potential collaborative projects that could be done. In fact, I’m told very often that my music is very visual and people can see these cinematic scenes when listening to it. I think that my soundscapes encourage people to add other kinds of media to it. EE: I think it happens because what you’re playing is so expansive so there’s a lot of space to be filled. You are playing really clear and rhythmic music but the space creates this opportunity or invitation for a dancer or photographer to come in and fill the gaps with their vision. MA: Is that some kind of generosity on your part? You don’t want to take up all the room, that you leave space? BH: Typical songs take up all the space and leave very little space for interpretation—is that the reason you are doing this kind of abstract music?